Once Brock Lesnar entered the cage and pushed Daniel Cormier it was announced that the two would face off in the future leading most to assume it was a done deal. However, when the UFC 230 main event was announced as Daniel Cormier vs Derrick Lewis it caused a lot of fans to scratch their heads and ask questions. Why wouldn’t they wait for Lesnar? Did they make the Lewis match-up just because UFC 230 was in trouble? Why is Gamora? Unfounded rumors have started that Lesnar popped positive on a USADA test and that’s why he’s not in the main event. The new policy of not announcing drug test failures until a fighter has had their due process means that Lesnar failing a drug test wouldn’t be made public until the policy’s restrictions were met. Naturally that means we would all know about it less than a week after the test was failed because the MMA community has very loose lips when it comes to news like this. In no way are we accusing, reporting, or claiming that Brock failed a drug test. We are with the majority and think that the Cormier vs Lewis fight was made to save a card without a main event. 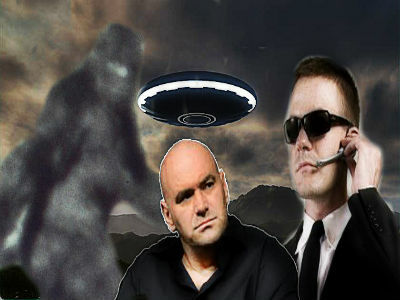 We do, however, find UFC conspiracy theories often entertaining and we hope you do, too.